I recently completed an interior project for a client who wanted to spruce up the ground floor of her family home here in London. I loved this project not only because my client was amazing to work with, but also it was a real testament to show how interior decor changes and styling can literally transform a space. Many times we work with full renovations and that type of makeover always makes a huge difference in a home. We therefore often believe that we cannot achieve a large impactful change though using just fabrics and decor objects (you will see in today’s post that this is simply not true). In this case we focused mainly on furniture, painting, textiles and styling. The results are were fantastic. 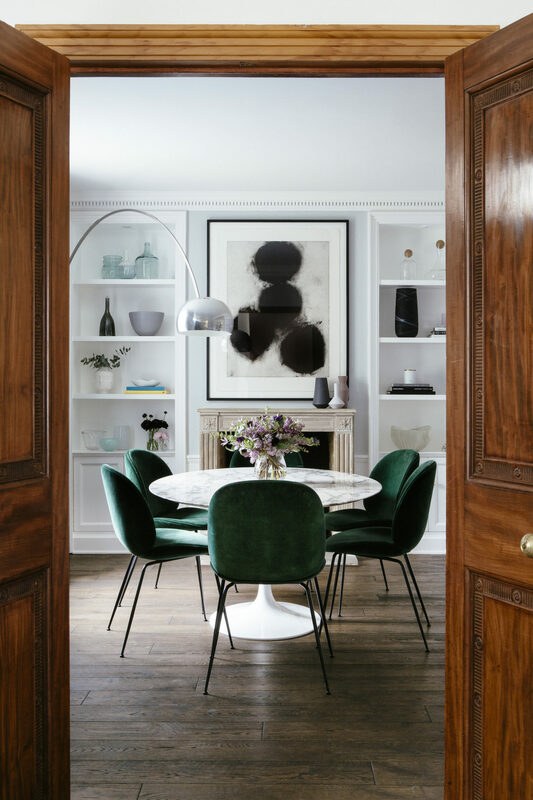 I wanted to share this interior in hopes that it can be used as inspiration for anyone who is desperate for a big change in their home, but doesn’t necessarily want to renovate or devote time to building works. Sometimes it is all about small changes for big impact! We did the most amount of “work” in the dining room, as we changed the shelving from glass shelves to wooden ones (this change literally transformed that wall). 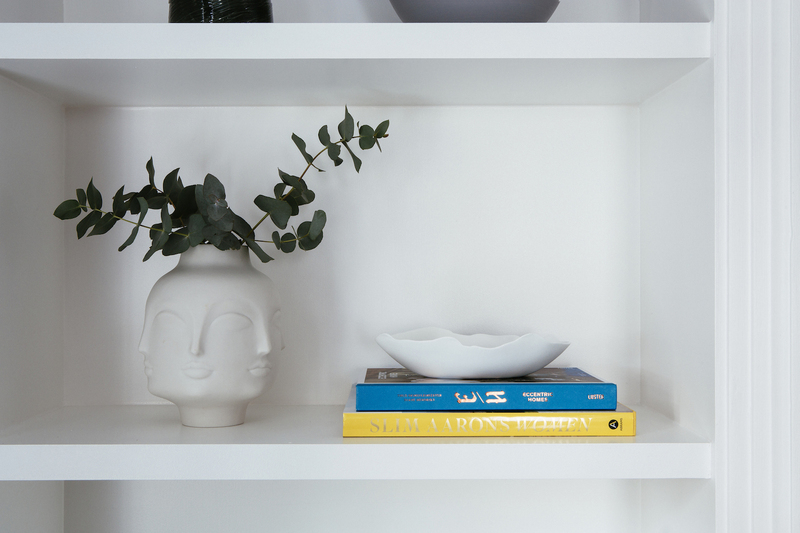 I personally love stark white wood shelves, they provide the perfect backdrop for decor objects. Something that was also important to me was to incorporate the new furniture pieces with my client’s already existing ones. She had already owned this fantastic oval Tulip dining table and the Arco LED floor light which I love, so we worked around these two important pieces. 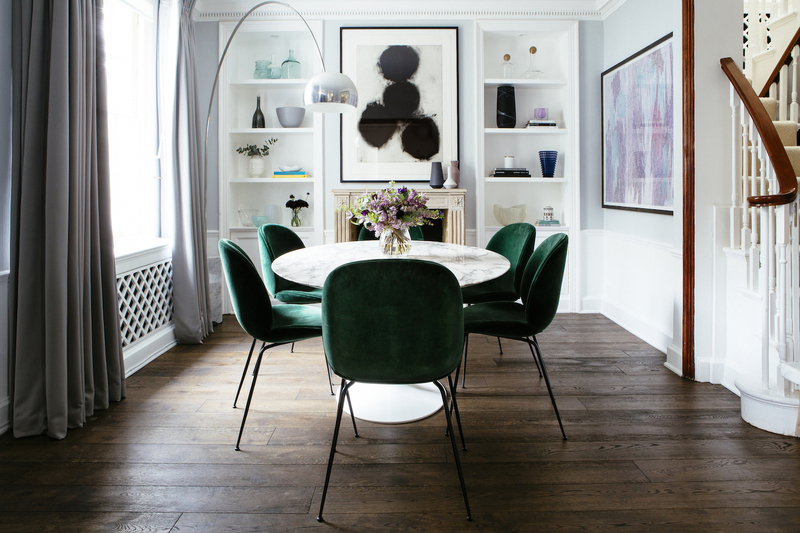 We decided to go for the Beetle dining chairs in green velvet by Gubi which were purchased at Conran Shop. These have been on my wish list for some time now so it was really wonderful being able to design with them in this project. 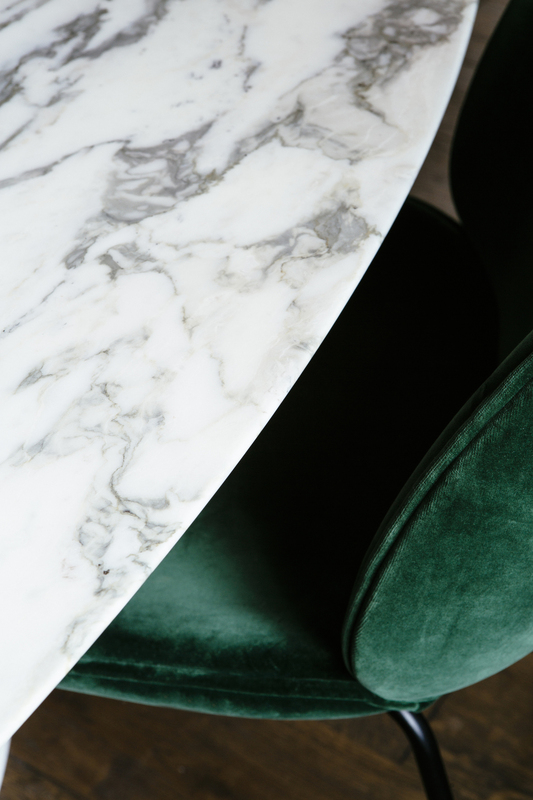 I thought the chairs were a beautiful match to the grey marble tabletop and the chrome floor light. I also wanted to bring in some pops of black to offset the stark white shelving. 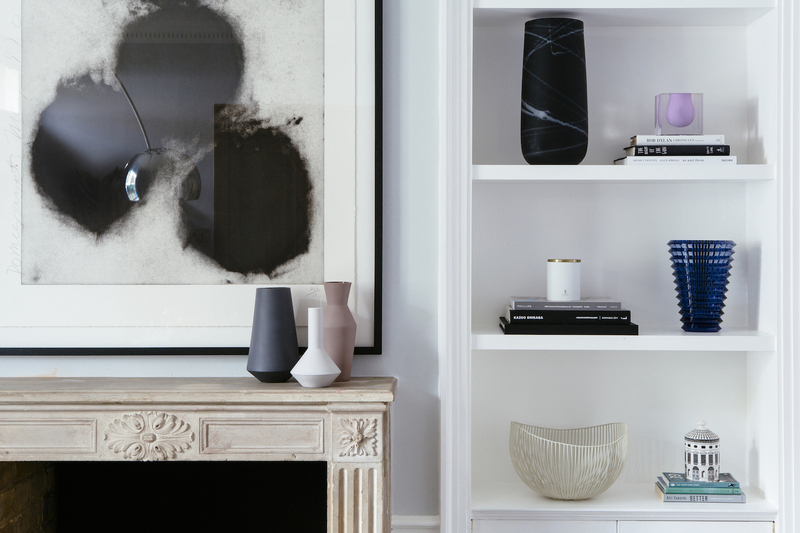 This monochrome abstract artwork sourced from Paddle8 was added, as well as decor objects like these minimal clay vases from Ferm Living on the mantle. We kept the styling in the shelves clean and tonal, with small pops of purple and blue to highlight my client’s coveted lavender artwork. We went for a light grey from Farrow and Ball for the walls. We decided to keep it light and fresh, as this room tends to be a darker room in the house, but we also pick up on the marble and chrome accents. Simple tonal shelving allowed for special pieces to really shine. This Jonathan Adler Vase is always a favorite of mine. 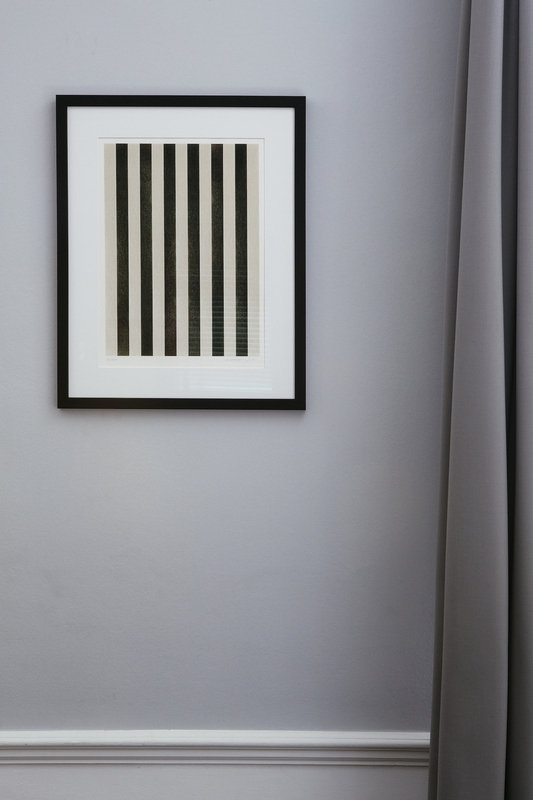 I love this monochrome striped artwork that we brought in, bringing a small touch of vintage into the space. The cutest. 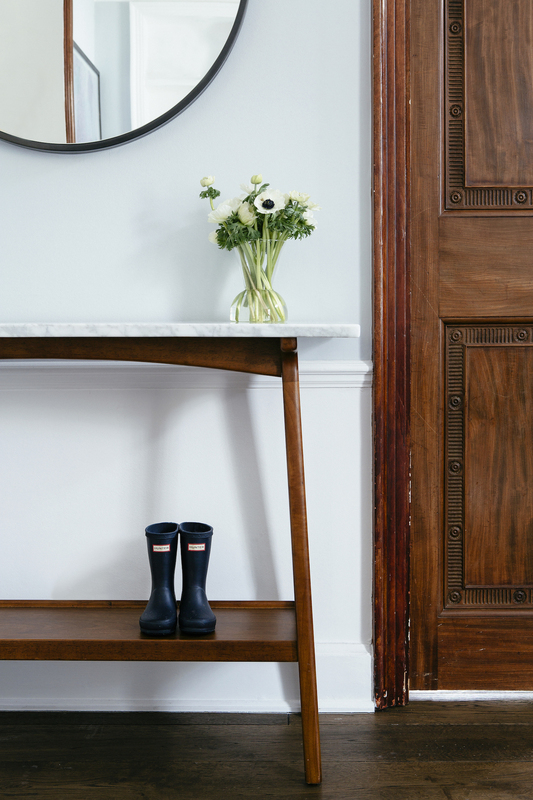 These mini Hunter boots on the console table on the opposite wall with a black circular mirror above (both pieces from West Elm). This is amazing. I seriously love this post. I like the solutions to the design problems. This post is very helpful for me.